Your dream home. Your 3D design. Experience your timber frame home from every angle long before we even set out to hand-pick each beam. With just the click of a screen, you see it all: the nook by the window where you’ll curl up and read the paper, the harvest table where family will gather for your famous lasagna, the eye-catching roof beams your friends will admire on their way out to the deck. With photorealistic timber frame house designs in 3D, nothing is left to chance. Our 3D modeling software allows you to take a virtual walkthrough of your project on a computer screen to fully envision how it’ll look and feel long before we start the building process. Accurate 3D renderings provide several critical functions that aid our builders, partners and homeowners in ensuring the final product is exactly as you envision it. Timber frame projects represent a substantial investment—whether it’s a timber frame pergola, custom timber frames for a new entrance or a new timber frame home—and having the option of seeing what it’ll look like in advance offers worthwhile peace of mind. Our goal is to make the design process as collaborative as possible. Your input is essential. With your feedback, we tweak your timber frame house designs until they feel just right. We take on projects of all sizes, and for the larger ones we often collaborate with designers, architects, engineers and general contractors. Having the ability to work from a 3D model allows everyone to visualize the end goal and stay on task. 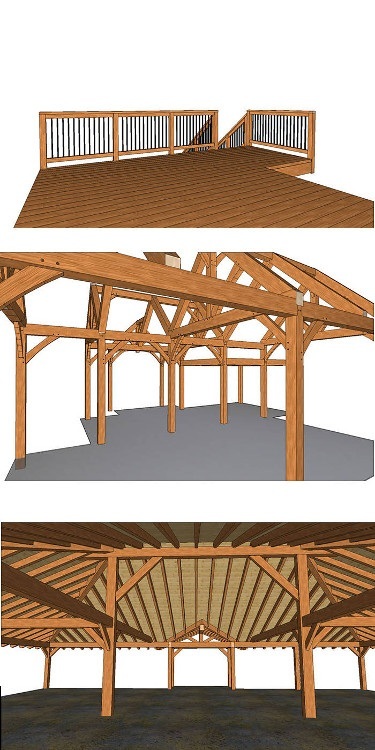 Using Cadwork’s Timber Frame design software, we combine the best of new-world technology with old-world craftsmanship. It allows us to plan your timber frame home or outdoor kitchen down to the millimetre. After cutting the materials to the exact measurements in our shop, we then assemble it on site with the utmost care.